A scene from Africa’s legendary past plays out everyday on the continent’s Atlantic coast, in a place called Gabon. Here, thousands of sea turtles invade the coasts and forest elephants hide in a vast untouched rainforest where western lowland gorillas and chimpanzees live in harmony. Approximately the size of the UK, nearly two-thirds of Gabon is rainforest – a pristine paradise for the country’s wildlife. And although Gabon’s human population is only around 2 million, it has a total of 13 national parks! Loango National Park borders the Atlantic coast. Here, herds of elephants roam vast, secluded beaches; the waterline is busy with stomping hippos, and, if you’re lucky, you can spot manatees frolicking in the lagoons. Most of these animals have one thing in common: they are critically endangered. But here in Gabon they have found a haven. Far from the lagoons, mangroves and beaches of Loango National Park, an ancient untouched rainforest flourishes. Rare species like the African forest buffalo and red river hog, with its striking orange-brown fur, roam the forest at night. Two different species of ape – Western lowland gorillas and chimpanzees share the forest. Intrigued by this relationship, Scientists at the Max-Planck-Institute in Leipzig are studying the apes in some of the most inaccessible jungle regions. 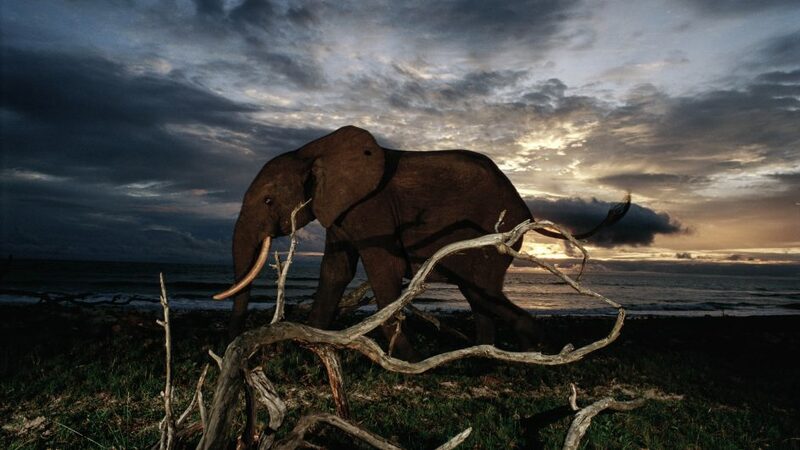 The true rulers of Gabon’s forests are the forest elephants. Nearly half of the world’s forest elephants live here, in this forgotten paradise between the Atlantic and the Republic of Congo. Despite the constant threat of poaching and human encroachment the grey giants thrive. Why? They are smaller than their relatives on Africa’s savannahs – able to effortlessly steal through the dense forest to evade danger. But this ability also makes them difficult for scientists to study. It takes a long trek into the country’s remote southeast to get close enough to catch a glimpse of these beautiful creatures. Here, far from human roads and settlements, the forest elephants gather to drink, to feed and to savor vital salts trapped in the soil. Some animals cannot hide away. On Gabon’s beaches, thousands of loggerhead and olive ridley sea turtles emerge from the ocean each year to lay their eggs in the hot sand. There’s always an audience of predators, waiting for the hatchlings to start their sprint from nest to water. Those sea turtles that manage to survive may one day swim with the giants of the sea – the humpback whales. During mating season, thousands of these majestic creatures gather off the coast of Gabon! Millions of hectares of untouched rainforest; a coastline of dreams; beautiful bays and tree-lined golden sandy beaches – this is Gabon, a forgotten paradise, where wildlife still rules.